Note to self… when you’re hungry as a horse post WOD, eat first then log your workout. What the hellll is a “burpeep”? 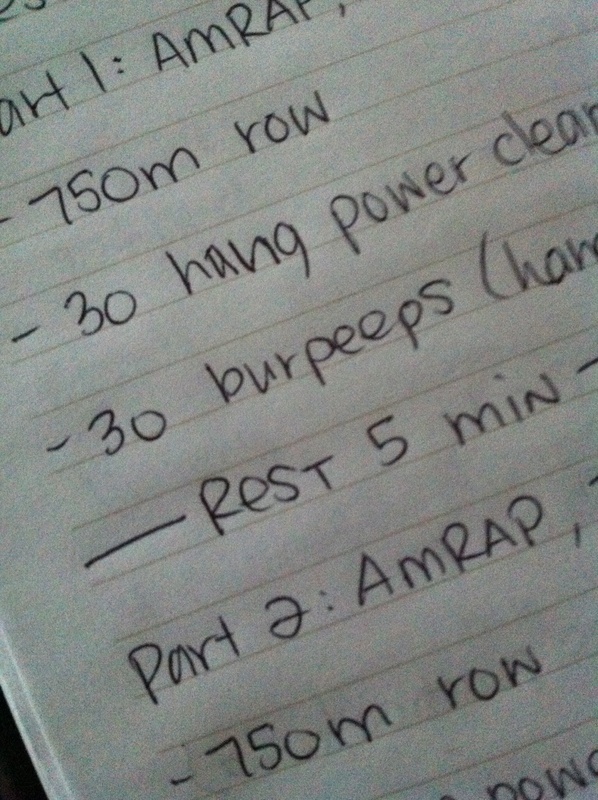 Couldn’t tell ya but my brain switched into autocorrect mode to avoid even writing the word burpee it seems. 30 Double unders after every round of thrusters. I liked this one 🙂 Should have been a tough guy and Rx’d this though. The #55 went up all 55 reps quite comfortably. Get comfortable with being uncomfortable, right? AND… I GOT SOME DOUBLE UNDERS!! Mostly right at the end when the WOD was all said and done, but whatever. The scaled version for this one was 20-30 seconds of practice each round. Well played Coach Dave 😉 we’d still be there now if I had 30 to do each round. Tuesday I hit the 9:15 with work Dave. After months of talking about it, he’s finally all in and loving it 🙂 Does that count as my “make someone else better” action? I put the bug in his ear. If I ever won the lottery, I can think of a few other people in my life who I feel could really benefit from all crossfit has to offer… It has certainly helped me be a better me. Yesterday, it tried to make me barf. Result – 15/30+10/9:38 – going on memory here. May not be exact. This genius thought “I can go hard in the row! Keep my split time around 1:45 and fly through the 750m!” WRONG. 400-450m in, I was dying. Slowed things down to a more realistic pace, but still wobbled to the bar on jello legs and had to take a second to recompose my breath before picking the thing up. By round 2, I knew better. Spent my afternoon at Sport Chek playing with boxes and shoes and generally trying to make sense of the chaos there. This weekend is inventory. That in itself is a scary word for anyone in retail, but in this store it’s terrifying. My manager brain has to be turned off. It’s not my store. But if it was, I’d be in an all-out panic. Sets the scene for my weekend though. Looks a little something like Henrys/14.3, Henrys/Chek, Hockey/Henrys with sleep tucked in there where possible. By Monday, I’ll be spent.